Dove is promoting their new body lotion range with the communication ‘Bring Your Body Language to Life’. No points for guessing the channel of choice on the web. The Dove Skin Page on Facebook has campaign details and range display for the Body Lotion for specific skin types, which lead to the Dove Site. The Facebook page also has a Photo Analysis section with inputs from a Body Language Expert on candid shots of the real women who appear in the international campaign. What would have probably been interesting are body language cues or decoders, interactive elements– Polls, Voting (Ref the US Skin page) or Quiz, Tips (Ref the Australia Skin page). The Dove brand page, an international initiative (managed and leveraged really well for multiple campaigns across countries) has upwards of 3.3million fans. 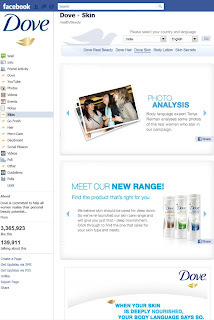 Check out the campaign at: http://www.facebook.com/dove - Dove Skin.